As we move through Championship Week, we’ll continue to bring you short reviews of each of the automatic qualifiers to help you fill out your bracket next week. Tournament dreams became a reality for four more teams last night. Here’s what you need to know about the most recent quartet of bid-winners. 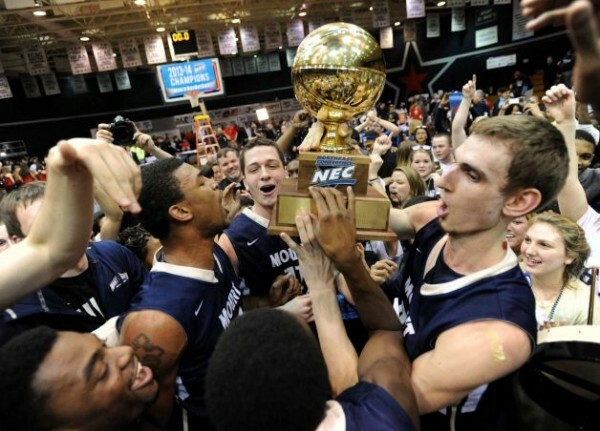 Mount St. Mary’s, .500 Record In Tow, Is Dancing. They Are Your NEC Champions. So much for the relative tranquility of the first few days of Championship Week (shouldn’t it really be called “Championship Ten Days”?). Mount St. Mary’s capped off an improbable NEC tournament run by thrashing top seed Robert Morris on their home floor, 88-71, sending the 16-16 Mountaineers to a likely date in the First Four in Dayton. If the Colonials still don’t know what happened tonight, the Mountaineers shot 61% from the floor, made 8-18 threes, and despite being one of the worst rebounding teams in America, found a way to outboard RMU (despite nine missed MSM free throws). Upsets happen in March, but the ease with which Mount St. Mary’s overcame their favored foe last night was truly shocking. For a team that finished 9-7 in the NEC, the Mountaineers aren’t that bad, I guess? Mount St. Mary’s was second best in offensive efficiency during conference play, and a modestly impressive 123rd nationally for the season. In averaging 70.1 possessions per game (33rd in the nation), MSM also has shown they don’t mind getting out in transition, where guards Rashad Whack (17.6 PPG, 79 3PM) and Julian Norfleet (17.5 PPG, 5.5 APG) thrive. But unlike many small conference teams, the Mountaineers pair their arsenal of pint-sized guards with a true post player, seven footer Taylor Danaher (6.9 PPG, 5.1 RPG, 1.3 BPG). Danaher won’t soon be confused with Dwight Howard, but his sizable presence won’t hurt when matching up with the bigger teams likely to inhabit the top seed lines. Mount St. Mary’s defends the three-point stripe reasonably well, but opponents should be able to find plenty of success inside the arc against the Mounts. MSM regular season foes shot 54.5% on two-point field goals in the regular season, which led to a field-day or three for the power conference teams on the November-December schedule. BYU went for 109, Texas Tech 100, and Michigan State 98 against the Mountaineers – all, of course, in resounding victories. Hard to believe much will be different if MSM finds their way into the 64-team portion of the Tournament. Best Case Scenario: A competitive first-half in the Round of 64. Any team in the First Four will have a shot at advancing, so Mount Saint Mary’s will be no different if they are sent there. But if/when they meet one of the four best teams in the country, a game that hasn’t ended by halftime would demand a stellar effort from the Mountaineers. Rob Jeter’s Panthers’ Impressive Run Through The Horizon League Has Milwaukee Tournament-Bound For The First Time Since 2006. 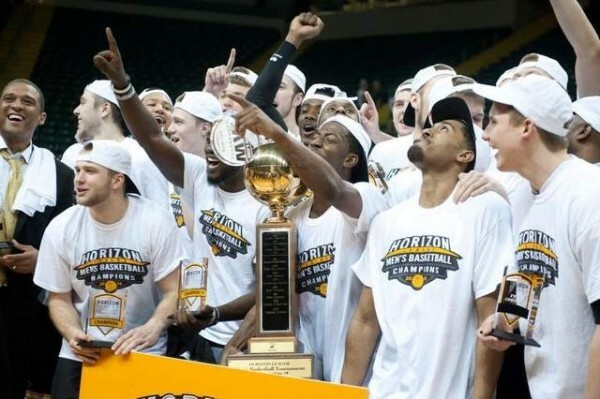 Milwaukee, a team that had won just seven Horizon League games all season, won four in a week to earn a ticket to the Big Dance. They had to beat Green Bay for a second time this year (in the semifinals) – something that possible #1 seed Virginia could not do once – to accomplish the feat. The Panthers will be a part of the Tournament for the first time since 2006 — the year after Bruce Pearl departed UW-Milwaukee (as they were then know) for Tennessee. Between that 2006 appearance and a Sweet 16 run the year prior, Milwaukee won three Tournament games, but this year’s team will need to find some serious magic if they hope to make it three straight winning trips to the Dance for the program. If nothing else, Milwaukee is equally average on both ends. The Panthers are almost right on the D-1 average for offensive and defensive efficiency, ranking 173rd in each category. Offensively, Rob Jeter’s team shoots a lot of threes (30th nationally in 3PA/FGA), but they aren’t especially accurate from distance, making just 33% of those attempts. They also get to the line a good amount (55th nationally in FTA/FGA), where they actually do shoot the ball well. On the season, the Panthers are converting 73.3% of their charity stripe efforts. Jordan Aaron is the team’s leading scorer at 14.6 points per contest, but it’s senior big man Kyle Kelm (12.4 PPG) who is the most efficient Panther when it comes to putting the ball through the hoop. A year ago, the Panthers went just 8-24 (3-13 in the Horizon). Their 7-9 conference season isn’t exactly the stuff that March sleepers are made of, but overall, this is a vastly improved team. With a pretty similar personnel base (four Panther starters were key parts of last year’s team) and no individual players seeing massive statistical improvements, it’s hard to figure where Coach Jeter made up all the extra wins (and efficiency, for that matter). The Panthers likely won’t win a Tournament game, but for a team picked to finish last in the Horizon in the preseason, making an appearance on college hoops’ biggest stage should be accomplishment enough. Best Case Scenario: Close loss in Round of 64. Depending on how other conference tournaments shake out, the Panthers should find themselves as either a #15 or #16 seed on Selection Sunday. But no matter which seed line it is, this Milwaukee team simply isn’t built to play the role of giant-killer. Bruce Pearl ain’t walking through those doors! WCC All-Tournament Team Members David Stockton And Sam Dower Keyed Another Gonzaga Title Run In Vegas. 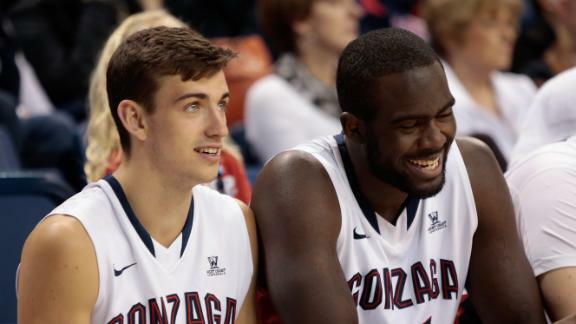 Surprise, Surprise — The Zags Are Dancing Again. After clinching yet another WCC Tournament title, Mark Few said that after going through what he called “the rockiest, most up-and-down season” of his tenure in Spokane, this championship meant a little something extra. Given the grueling 18-game WCC season, an unfamiliar abundance of doubt surrounding this group of Zags, and recent bracket projections indicating that Mark Few’s team may be perilously close to the bubble, we are inclined to believe him on that one. The chronically underappreciated Sam Dower was named Tournament MVP after averaging 18.3 PPG and 8.7 RPG in Vegas, and David Stockton joined him on the All-Tournament team after what might have been his finest three-game stretch in a Gonzaga uniform. Stockton bailed out the Zags with a buzzer-beating layup in the quarterfinals, and then proceeded to average 11 PPG and 5 APG over the course of Gonzaga’s tournament stay. It wasn’t easy – just ask Few – but the Zags are again the class of the WCC. Gonzaga teams have a reputation for being soft and not especially defensively-inclined, which is probably why the defensive proficiency of this Bulldog team has been largely ignored. The Zags are 13th in the country in defensive efficiency – easily the program’s highest ranking in the category since Ken Pom began tracking it in 2003. They don’t force a ton of turnovers, but opponents have really struggled to make shots – from both two (42.8%) and three (31.8%) point range. BYU found that out in the WCC title game last night, when the Cougars shot just 36% from the field, including 3-13 from three-point range. Gonzaga skeptics have long harped on their defensive liabilities, but please, if you are going to doubt this Bulldog squad, find a different crutch to lean on. It’s 2014, and Mark Few’s team is defending at an elite level. In part two of “you may not know this Gonzaga team as well as you think you do”, the Zags largest deficiency has to be their work on the backboards. The sizable frontcourt pairing of Dower and 7’1” Przemek Karnowski would seem to preclude rebounding from being a major issue for this team, but despite capable rebounding percentages from both Bulldog big men (each ranks among the nation’s top-200 in DR%), Gonzaga ranks just 84th nationally in defensive rebounding percentage — and 201st in the offensive version of the metric. The problem for Few is that he plays almost nobody else capable of helping out on the glass. Kevin Pangos is the Zags third tallest starter at 6’2” (!!!) and 6’8” Angel Nunez is the lone reserve that even begins to resemble a post player, but even he averages only 7.6 MPG. The Zags were annihilated on the glass in the biggest game of their season at Memphis – a similarly destructive effort on the backboards by an NCAA Tournament opponent would likely end Gonzaga’s season. Best Case Scenario: Final Four. Many will question whether Gonzaga is tough enough to now make a sustained NCAA Tournament run, but the Zags have both size and talent, and allow me to repeat – THIS IS THE BEST DEFENSIVE TEAM MARK FEW HAS EVER COACHED. Assigned to their old role of bracket-buster, the Zags have hidden potential to make serious March noise. 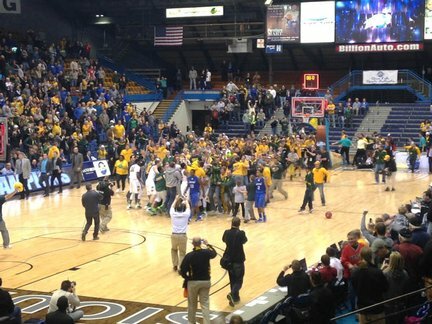 The Party Is On In Fargo: North Dakota State Is Heading To The Big Dance For Just The Second Time In School History. The Bison almost went the way of earlier Tuesday night favorites turned Championship casualties Robert Morris and Wright State, but hung on to beat IPFW by three in the Summit League final. And for that, college basketball fans, you should be extremely thankful. A dazzling RPI number of 38 removes a little bit of the fun from this potential Cinderella (it’s better when they don’t see it coming at all), but this is still the best team out there that your average college basketball fan doesn’t know about. They play their home games in Fargo, North Dakota, after all! Want to know who is aware that NDSU can ball? Notre Dame, who dropped a game to the Bison in the Joyce Center in December – back when the Irish still had star Jerian Grant in the lineup. An explosive Bison attack is led by Summit League Player Of The Year Taylor Braun (18.3 PPG, 5.4 RPG, 3.9 APG), who has rather quietly authored a Nate Wolters-esque senior season. Braun does a little bit of everything, but first and foremost he is a scorer, as he shoots 42% from deep, 51% from two-point range, and 79% at the stripe. But as good as Braun is, he gets plenty of help from his teammates. NDSU ranks 20th nationally in offensive efficiency (hint: that’s really good), and slick-shooting sidekicks Marshall Bjorklund (13.4 PPG, 63% FG), TrayVonn Wright (11.3 PPG, 59% 2-PT FG), and Lawrence Alexander (11.2 PPG, 38% 3-PT FG) are all big reasons why. NDSU is a fairly average defensive team across the board (although they do rebound the ball well on their defensive backboard), but they have found particular struggles defending the three-point arc. Opponents have shot 38% from three-point range against the Bison, and nearly 30% of all points scored on Coach Saul Phillips’ team came from beyond the arc. What’s more, in North Dakota State’s six losses, opponents fared even better shooting the three-ball, making a whopping 48% of their attempts in those games. Any team can get hot for forty minutes, but a good draw for the Bison would include avoiding a team that can get prolific production out of the three-point shot. Best Case Scenario: Sweet 16. The RPI number may be a bit inflated (Pomeroy and Sagarin seem to think so), but Braun and company are for real. The draw matters for the Bison, but this is an offense efficient enough to carry NDSU through the first weekend. This entry was posted on Wednesday, March 12th, 2014 at 9:20 am by Bennet Hayes	and is filed under 2014 ncaa tournament, bracket prep. Tagged: David Stockton, feature, gonzaga, horizon, jordan aaron, Julian Norfleet, kevin pangos, Kyle Kelm, lawrence alexander, mark few, marshall bjorklund, milwaukee, mount st. mary's, nec, north dakota state, przemek karnowski, rashad whack, rob jeter, robert morris, sam dower, saul phillips, summit league, taylor braun, taylor danaher, trayvonn wright, wcc. You can follow any responses to this entry through the RSS 2.0 feed. You can leave a response, or trackback from your own site.